We hope your bracelets make you as happy as they do us. Hey y’all, we are Chrissy and Ryan Jones the designers, makers, and everythingers of your new bracelets. We were so excited to make you your new opal jewelry and we hope you love them. We hand-fabricate all our own work in Beaumont, TX and the opals come directly from the miner in Australia. The bracelets are made to love so adjust them to fit comfortably for you. 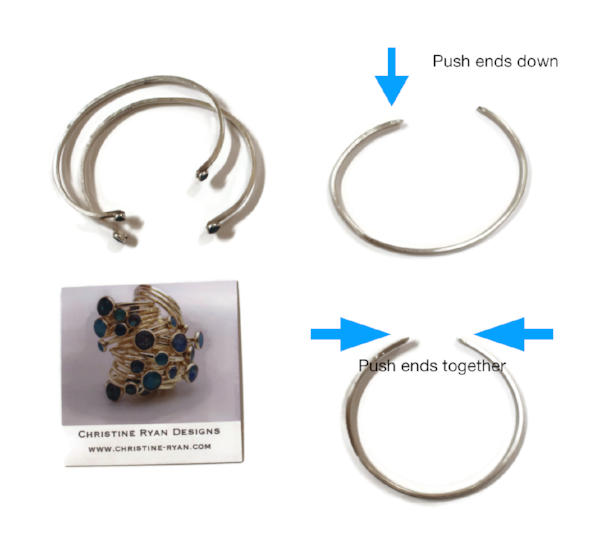 Here is a picture of different ways to adjust the bracelets. You can squeeze the ends together like a circle or push the ends down to make more of an oval. I over-exaggerated the options, but you can adjust your bracelets as needed. If you need anything more, we are available to help. Reach us online or by phone. We can help make adjustments or exchange. Also, a a special opportunity use coupon code OPAL for 15% off, we want to get to know you more so hang out and shop with us. Ryan was looking to purchase jewelry for me, but the most beautiful designs would cost him an arm and a leg. Like everything else he learned how to make it himself. After many boxes of supplies arrived and secret missions in the shop, Ryan presented me with two handcrafted rings. With extra stones and settings we began Christine Ryan Designs. Our jewelry design company expanded from traditional stone setting to sourcing unique stones which lead us to Australian opals. Now we work exclusively in opals, working directly with the opal miners to select the best quality and color. Ryan has been a firemen since 2004. Shop our opals that support firefighters.